Helping professionals, managers and staff increase communication effectiveness. Why is it that at times we easily resonate with certain individuals while at other times we find ourselves frustrated with others? Quite obviously we may be speaking different “languages.” Communication style or “language” often has a great impact on how effectively we work together and on what we can accomplish with others. Learning about personal styles will help you get a deeper understanding of your own preferred style of communication. But it will also help you understand other’s best communication style. This will improve your ability to more meaningfully interact with colleagues and clients and will positively influence how they perceive what you are asking them to do. The I-SPEAK Communications Style program explores four styles, helps professionals discover their own personal style and teaches new ways to communicate with others. The I-Speak goal is to develop greater awareness of other styles and create more productive, effective working relationships. The bottom line: Increase your communication effectiveness in a shorter amount of time. People have recognizable and preferred communication styles. It is possible, after relatively short exposure to a person, to identify his/her style. People communicate most effectively with individuals whose styles are similar to their own, and they have greater difficulty with people who exhibit dissimilar communications styles. People can modify their styles to “speak the language” of others. 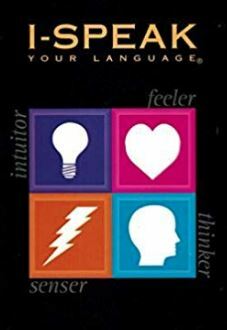 I-SPEAK teaches how to determine communication styles (both their own and those of others) and helps them to use this knowledge to foster enhanced communications. These skills are readily applied to improving internal communication within our organization as well as other professionals you whom you communicate. Imagine how thrilled a client would be if you offered this program to better increase communication and productive outcomes while working together. Can you recognize your primary style of communication? Conceptual, synthesizer, idea people, problem solvers, leaders and long- range thinkers. Intuitors derive great satisfaction from considering the world of possibilities. Often their input serves as a catalyst for those around them. They assume others see things as they do, they expect their actions and communication to be self-evident and understood by most. Analyzer, systematic, logical, step by step, concrete and sequential. Thinkers place high value in objectivity and orderly inquiry. They are disciplined and deliberate decision makers. They assume others see things as they do. Concrete, pragmatic, detail oriented, realistic, quick to put into action. They are here-and-now oriented and thrive on getting things done in the present moment without time-consuming deliberations. They are known for their ability to get things done and are likely to express a direct and energetic approach to work and life. As individuals come to recognize and acknowledge the influence of their own style on their thoughts and actions, each begins to appreciate the importance that other people’s styles hold for them. This understanding improves the ability to more meaningfully interact with others, and will positively influence how others perceive you. Interestingly enough we all tend to alter our communication style a bit when under stress. So do your co-workers and clients! Think of the advantage you can have if you know how to best take in information during heightened and more stressful times. The I-Speak program offers a 15-minute self-assessment which will determine, with great accuracy, an individual’s specific day-to-day communication style and their style when under stress. Consider the advantages for both you, your staff and clients. Merry Neitlich, managing principal of EM Consulting is an approved I-Speak trainer. Depending on your needs, we can provide test administration and results interpretation during a 2-hour interactive engaging program.